The Unlikely Homemaker: Do you teach your tots? Do you teach your tots? I have been tossing around the idea of home schooled preschool with my son (2 1/2 years old), for quite a while. I would love to have a routine during the day, where I can have an hour every day to focus on learning. My problem (besides the fact that I can't get a routine down for anything) is that I haven't found the right materials. I have been looking for something with good learning tools, as well as something that can hold my son's interest. Well, I think I've solved that problem! My son LOVES Toy Story, so I am sure this will hold is attention. At least for a short amount of time. 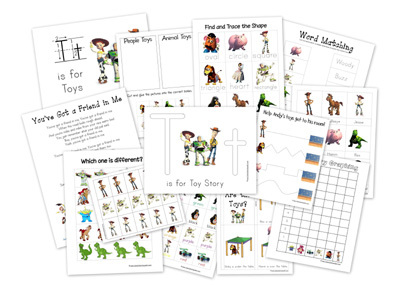 You can go here to view and download the different selections of preschool packs. Oh, and did I mention, these are FREE? I hope to be organized enough to keep you posted on how well this works for my son. Do you do any sort of homeschooling for your toddlers? Do you have any advice to offer? I have a son and a daughter the same age as yours and I do small "tot learning" times with my son. I use a lot of resources from 1+1+1=1 as well as Confessions of a Homeschooler. Oh and 2 Teaching Mommies has some great printables as well. I came over from Money Saving Mom as well- can't wait to try the frappuccino recipe. Thanks for sharing! I can't wait to try this tomorrow. What a great find. My boy is the same age and right now we are working on "life experience" learning. His verbal skills seem to multiply every time we do something exciting to him like the museum or dino dig or feeding the bunnies in the yard. He gets so exicted to describe his experience. @acornsandoaks Thank you so much for the info! And for letting me know you aren't completely structured for this age group. I really have no idea how homeschooling goes, or what I can expect at each age. I love the learning toys you suggestd, too! My son would love them! He is a puzzle lover. @Amanda Thank you, it's nice to hear some feedback about 1+1+1=1! I just came accross their site, but was so excited to find the pre-school pack! I am trying to fit a "learning time" in on most days, but sometimes I just run out of time. I would love to hear how you fit it into your day! @Erica I would love to hear how he does! I showed my son, and really he just wanted to color :0) Life experience is definitely great, too! We just went camping, and I am always amazed at the new things my son does and says after trips like that. For example, he saw a bunny for the first time. He was so excited, and we sat by a bunny for about 15 minutes, watching and talking about the bunny (where it sleeps, what it eats, etc. )What a fun experience! Thank you so much for sharing about my site! I hope your son enjoys the Toy Story Pack, I had so much fun making it! @Carisa You're welcome, and thank YOU so much for creating these great packs! I've been buying little hooked on phonics packs, and printing out random pages for my son, but can't keep his interest. I love that you have such a huge variety, and you made them so fun and easy! I'm going to be posting pictures on his progress.